Will you be able to transfer over your older posts or will you leave this blog up? Some of your older posts, (Suggestions, your 'how I got here series), are good reading for aspiring authors looking for inspiration. Thanks, and congrat's on the journey thus far. Very excited to see the new blog! Congrats! Is your new website going to have the same adress for your website? 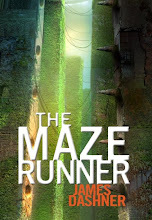 Are you going to be coming out with a movie for The Maze Runner? *****ATTENTION****** JAMES DASHNER I CHALLENGE YOU ALLY CARTER AND RICK RIORDAN TO WRITE THE LONGEST SERIES OF BOOKS IN HISTORY!!!!! IT WILL BE HARD BUT NOT IMPOSSIBLE!! JUST TRY!!! HAPPY WRITING!! AND MAY THE ODDS BE EVER IN YOUR FAVOR!! !